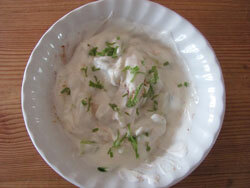 I love to do Indian food on my BBQ and a cucumber raita makes the perfect side or serve it as a dip. Indian food is generally spicy but does vary in degrees of heat. Certainly when I reach the top end of the scale I can feel the steam coming out of my ears but whether it is Indian spice or Mexican chili the remedy to take some of the heat away is still the same – a yoghurt cooler. TIP - If you do eat something too hot for comfort, a dairy drink is the best course of action and yoghurt more so than milk. It is capsaicin in the chili that causes a chemical reaction with the nerve receptors in the mouth and gives that burning sensation. Whilst cold water will reduce the burning temporarily, this is down to the physical temperature of the water and nothing else - water actually spreads the burning sensation. It is casein in dairy products that act as a detergent and "dissolves" the connection between the capsaicin and the nerve endings and lactic acid (specifically in yoghurt) that acts as a solvent for the capsaicin. Both of these factors contributing to the cooler effect. Note: The science behind why yoghurt is a great cooler also applies to sour cream in Mexican food. So a raita is not only an excellent accompaniment it’s also a great cooler too. 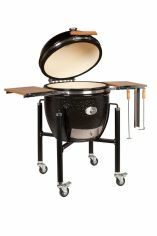 Make it a couple of hours in advance of your cookout and refrigerate to let the flavors mingle and of course to keep it chilled. I used this recipe to accompany my plancha grilled mini lamb koftas. Peel the cucumber and slice it into thin strips. After that, just throw everything into a bowl and mix. Refrigerate for one or two hours to ensure that the whole mix is nicely chilled. The salt will leach out some fluid from the cucumber so give your cucumber raita a stir before serving. However you choose, it'll certainly come in handy if you've been a little too generous with the chillies!